Halve the apricots and carefully remove the pits. Heat a grill pan over high heat for a few minutes until it is very hot. Set the apricots face down on the grill pan and let cook, without moving, for a minute or two. Carefully remove the fruit and set on a plate, grilled side up. Top with a spoonful of creme fraiche and sprinkle with chopped nuts. 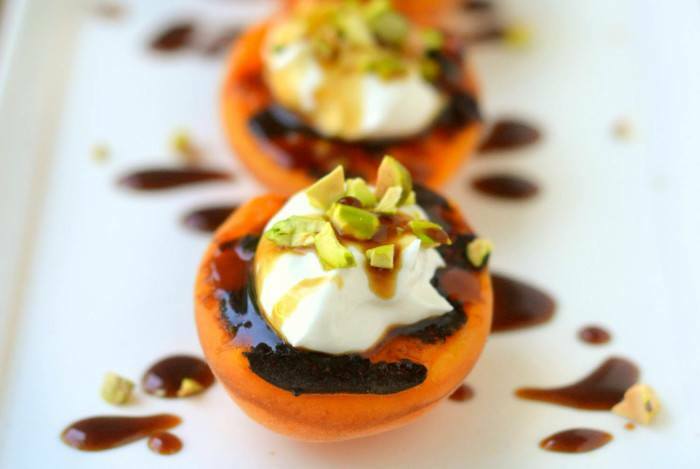 Drizzle the fruit with the pomegranate molasses and serve.